Continuing to work on some odds & ends. Mostly single figures to fill in gaps or finish off batches of figures. Finished the orc skeleton for my non-human skeletons, an old (mid?) school wight, and an old RP mini that will also be going in with the wights. I hate to do it, but I am considering shutting off commenting on my blog. I am getting boatloads of SPAM for some online casino. Or at least that's taking it at face value, I'd never click on the links to check if that's really what it is. But for the past few weeks, I have have to delete the daily round of spam comments, it seems. And it's getting annoying. That would be a real shame - I like to have some kind of interaction with the artist behind the work on display, even if it's just to pass a compliment. The rusty battle ax is my favorite part. 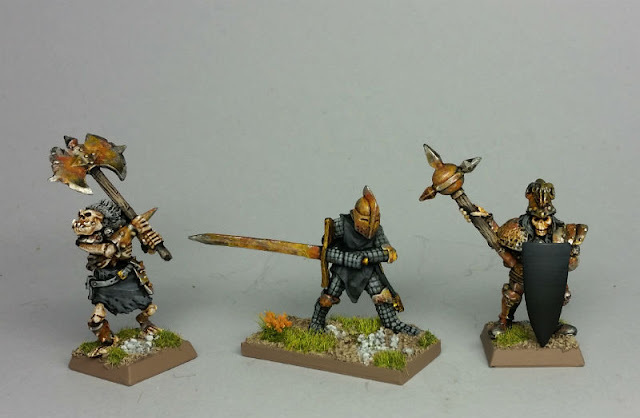 I've got some old skeleton minis that I need to paint up, will be looking at these for inspiration. Thanks for sharing! You might try some options like "prove you're not a robot", captcha or moderation before turning it off completely. Have you been reporting them as spam? Yes, I've been reporting them. But it seems like new accounts all the time. I thought I had that "not a robot" thing, but not sure since I'm logged in all the time. I don't *want* to turn off commenting, so I'm going to try digging around some more for further spam-blocking options.